Brooke Lewis is excited about returning to the Indulge L.A. Chocolate Festival and Pastry Show, where she will be a special guest host for the second year in a row. The event takes place in the afternoon on December 27 at the Olympic Collection Banquet Center in Los Angeles. Lewis believes it’s the perfect place to bring a date. The Hollywood dating expert, life coach and actress is winding down a busy year. She recently wrapped up the first season of her online TV dating show Breaking Dating, appeared on several talk shows including The John Kerwin Show which airs nationwide on DirecTV and has been a dating expert on Hulu’s Pop Trigger. She also has clients and speaking engagements that take her to Las Vegas and throughout Southern California. While Lewis has plenty to celebrate, she says the holidays can be a tough time for dating. Lewis says it’s especially tough for men who may be casually dating a woman but now have to grapple with questions about buying Christmas gifts or bringing a “semi-girlfriend” home for the holidays to meet family members. On the flip side, some singles are often too eager this time of year to find romance. “People will jump into a super casual relationship right around Christmas time,” says Lewis, who notices a lot of single people don’t want to be alone around the holidays, especially if they have friends who are in solid relationships and don’t want to feel left out. Lewis says in some cases, it’s best to date casually while filling the void of loneliness by spending time with true friends and family members. As a life coach and dating coach, Lewis is able to keep her clients accountable and on track with obtainable goals as they head into the New Year. That’s not to say online dating can’t be effective. However, Lewis warns people to be cautious about using apps like Tinder, in which profiles are based on photos and can be “swiped” off screen in one direction to be saved for later or in another direction to be discarded quickly. She says users, especially women, often mistake the instant intimacy of an online hookup for true intimacy. Lewis says there is nothing wrong with a new quick relationship but warns that every choice comes with a consequence. She says the best bets for online daters seeing a long-term relationship in 2016 are the old standbys, such as Match, eHarmony and JDate. “You know if someone’s paying to be on the site, they’ve got an agenda, they’ve got interests and they’re committed. Some of the sites have a very detailed entrance process, like eHarmony, where you’re taking the time to fill out pages and pages of information so they can authentically match you up. Lewis says she’s done her homework and tried all the popular dating sites, including the free ones which are naturally the most popular. In a surprise twist, Lewis actually met her co-host for Breaking Dating through an online dating site. The show just wrapped up its first 13-episode season with Zina Media Group’s TradioV and is currently entertaining offers from different outlets for a second season. 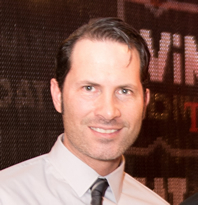 Rob Kachelriess is the Managing Editor of Vegas2LA magazine. He’s also a News Producer for KVVU Fox5 Las Vegas and the Las Vegas writer for Thrillist. ← Previous Story Do it Yourself!